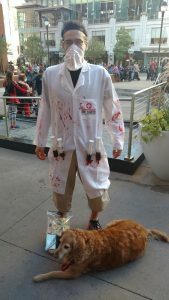 Fright Fest at Elitch Gardens and Zombie Crawl Downtown Denver? Yes, Please! This past weekend, Josh and I had some friends over from out of state. 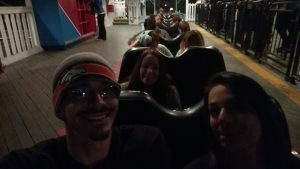 We decided to hit up Elitch Gardens on Friday night and then The Zombie Crawl in Downtown Denver on Saturday. We were going to kick it like we were teenagers again. We started off our Friday at the Tilted Kilt in Greeley from some drinks, appetizers and some games. 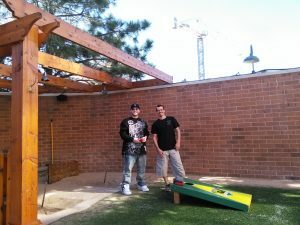 Zech, Josh and I played a couple games and got our drink on before we headed out to Elitch Gardens. 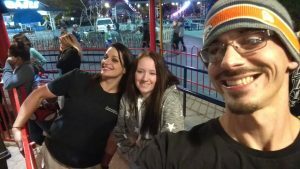 Once we arrived at Elitch Gardens, it was definitely interesting. Josh and I purchased our Season Passes at the beginning of the season and went throughout the whole summer. It was cool to see the transition the park makes once Fright Fest is happening. The decorations inside are very well done and they have actors roaming the park for those who want to be scared. The actors will run up on you or chase you with costume style chainsaws and do everything they can to get you to scream. For some, it was hilarious while for others, it might have been too much. We did notice that some of the kids who were cornered with the chainsaws were not thrilled with the experience. Most would run away and laugh after screaming but there were some who honestly looked terrified. It’s a fine line but you can’t come to Fright Fest and not expect to be scared. We had a couple actors sneak up on us and just follow one of us till that person noticed they were being followed, lol. 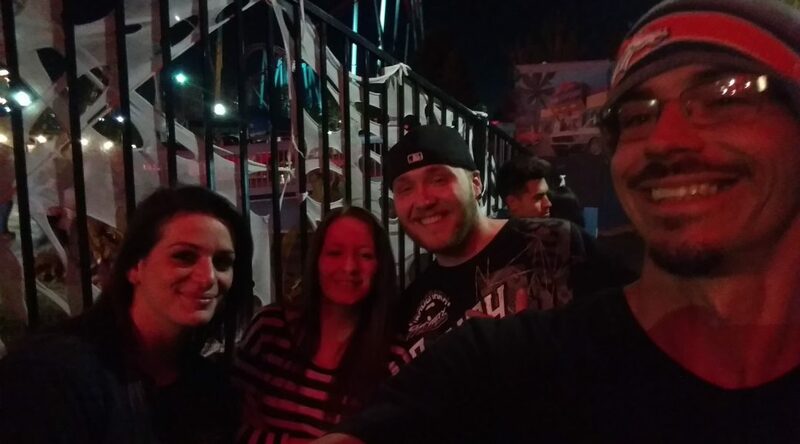 Josh, Amber and I decided to get in as many rides as we could before the end of the night. We started the evening off with the Ferris Wheel just for fun. The Denver cityscape is absolutely gorgeous at night and you can see the whole thing from the top of the Ferris Wheel. From there, we rode the Tower of Doom, The Dragon Wing, The Half Pipe, and The Twister 2. When I say, “It was awesome feeling like a kid again!”, IT WAS!! The adrenaline rush on each of the rides was great! The Tower of Doom is a ride that plunges about 200ft all at once, the Dragon Wing is a simple aerodynamic ride, the Half Pipe is a snowboard style ride where you are spinning in your seat while the snowboard shreds up and down a half pipe, and the Twister 2 is most likely the most rickety ride I have ever been on, but FUN!! On Saturday, we started the morning with some local artisan coffee and laid back attitudes. We spent the morning getting ready and headed down to the Zombie Crawl in Downtown Denver. Zech and Amber went as Zombies, Josh went as a Zombie Doctor named Dr. Shots and I went as a Cheerleader turning Zombie. People really get into the whole Zombie thing, it’s AWESOME! We stopped into Mellow Mushroom downtown and were able to nab a spot right on 16th Street to enjoy our pies with the meandering population of Zombies outside. The pizza was incredible and being able to sit and watch the parade was amazing. It’s always fun to dress up and have a great time! We walked all over before heading back to Greeley and finishing the evening off back at the Tilted Kilt. All in all, an excellent weekend!! Josh and I are definitely looking forward to dressing up for Halloween next weekend and parading around somewhere… we haven’t decided where yet. Feeling like a kid will keep a person’s heart feeling young. The best part of it all is being able to feel like a kid while also enjoying all of the perks of being an adult… Alcohol and Thrill Rides and Zombies and Alcohol and Costumes and … you get the idea lol.